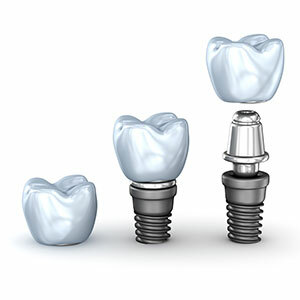 Investing in a dental implant is a smart way to restore the natural function and appearance of missing teeth. Dr. Caramico offers comprehensive implant restoration options that fit your unique smile. After your implant surgery, Dr. Tony will fit you with a permanent restoration that accommodates both your functional and aesthetic needs. Each selection is designed to rebuild the appearance of the teeth that have been replaced, with options from single tooth to full mouth reconstruction. Single Implant Crowns — If only one tooth needs to be replaced, a crown will be affixed to the top of the implant abutment, so that the entire piece mimics the design and function of single teeth. Multiple-Tooth Bridges — An implant’s integrity allows it to support the weight of more than one tooth. As such, Dr. Tony can pair two implants together to support an extended bridge for three or four teeth. Implant Supported Dentures — When you need to replace all of your teeth at once, a stabilized or implant supported denture can provide you with increased comfort and convenience. A properly placed and well maintained dental implant should last for decades, if not your entire life. To learn more about which type of implants are best for your needs — or to find out if you’re a candidate for treatment — contact us today to schedule a consultation with Dr. Tony. Dr. Caramico is the best! He helped my little daughter with her broken tooth so quickly and more importantly- painlessly!! !The entire office treats our family of 6 like gold! We are so lucky to have a great dentist!! !